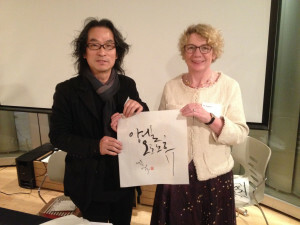 Our good friends at CICI invited us to a CQ17 evening learning Korean (Hangeul) calligraphy with famous calligrapher Kang Byung-in. The “CQ Forum” refers to culture, communication, creativity, cooperation, concentration, etc, and this was part of the 17th CQ Forum, hence CQ17. 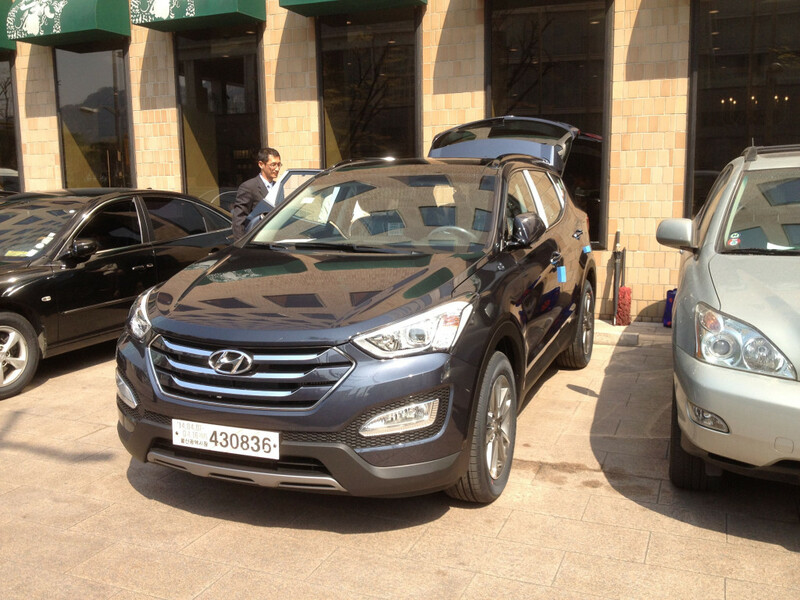 The CQ Forums are hosted by CICI, the Corea Image Communication Institute, headed by Choi JungHwa. This wasn’t the first CQ event that we’ve been to, but was one of my favorites so far. Mr. Kang gave us a brief presentation on the Korean alphabet, Hangeul, and then taught us how to hold & use the brushes. Then we practiced, drawing lines, squares and circles. 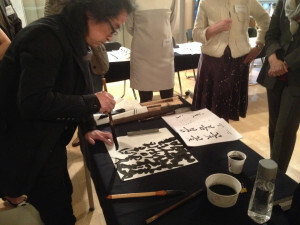 Then he showed us how to write characters in formal script — i.e., looking much like the printed letters, quite easy to read — and demonstrated calligraphy… which for me is much harder to read although it is definitely more interesting!. We practiced that with the words “spring” and “flower”. Then he showed us calligraphic techniques again, we practiced a bit more, and then we had to do “flower” one last time, on better paper, all in one go, a “one-shot”. 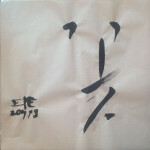 In addition to our final effort, we also took home a present from Mr. Kang: our name done in Hangeul calligraphy! That was an unexpected and much appreciated treat. The rendition of Austrian Ambassador Elisabeth Bertagnoli’s name had to be seen to be believed! 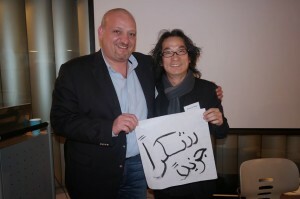 The Jordanian Ambassador Omar Al Nahar (who was, of course, a ringer as Arab calligraphy is itself an art form) did some Arab calligraphy and presented it to Mr. Kang. Anyway, it was a great evening and a big shout out to CICI (and the Alliance Française) for holding it. Thanks! Some of the pictures are mine, others were taken by photographers there. 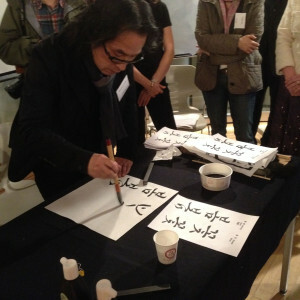 First, he does “flower” in formal writing, then in more casual writing, then interprets it calligraphically. I’m reducing the size of the photos that I upload, so posts (and pictures, if you click-through for the full size version) should all load a lot faster. About time, eh? means a room where the King eats his royal meals. Kings must have eaten good food cooked with ingredients in season harvested from every corner of the Korean Peninsula. 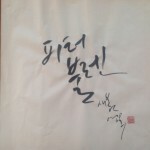 This means that the table of Dimibang is also filled with good food… In addition, Dimibang is the shortened title of a cookbook, “Eumsikdimibang.” Eumsikdimibang was written by a Jeong, the wife of a high ranking government official, in 1680 (the 11th year of King Hyeonjong). It is the first cookbook in East Asia written by a woman and in the Korean language. Not a bad name for a restaurant and, according to my internet search, also very popular in Spalin as a name for Korean restaurants. 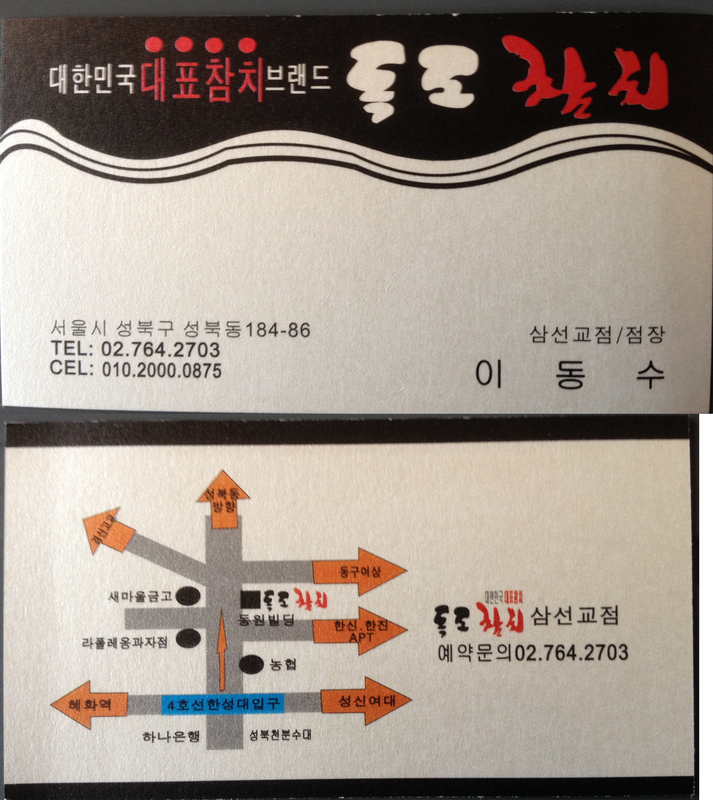 And the name of a nice little lunch place down on (yes, you guessed it) Seongbuk-ro near our house. Like several places along that particular block, Dimibang was mostly made out of wood. It seemed to be my day for caligraphy (scrawled all over one wall), as that night we were going to a class on Korean Calligraphy by famous calligrapher Kang byung-in. So, all in all, the signs were auspicious for this place! One of the two women who do the cooking was on the sidewalk, as I was peering into Dimibang trying to decide whether to go in, and swept me up and into the restaurant. What to do? I ordered 제육 볶음 (jeyuk bokkeum, stir-fried pork with red pepper sauce). The man taking my order gave me a choice of that or 소고기 국밥 (sogogi gukbap, beef hangover soup with rice). My menu options were limited due to being just one person… Foiled yet again! Typically, the translated menu was much shorter than what was on the wall. He was very nice, wishing me an enjoyable visit to his restaurant and generally being friendly (something that can be irritating or seem contrived, but not in this case). The jeyuk bokkeum was excellent, with a small but tasty selection of side dishes, including sweet-potato tempura; some sort of (radish-like) kimchee; a bit of greens (always nice!) and marinated green chilis. Surprisingly, the main course was actually stir-fried pork-and-squid in a red pepper sauce. Ah, I thought, Korean surf’n’turf! Curiously, that night I had “beef” that turned out to also have a bit of squid on the side. 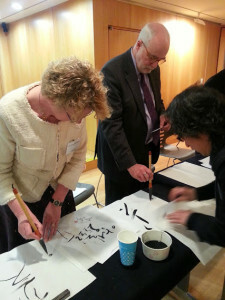 It’s Secret Squid Day in addition to being Korean Calligraphy Day? Part way through, they brought me a small sampler of the hangover soup. Good, but frankly hot/hot (temperature/spiciness) soups are the bane of my existence. Again, I was a late eater, and the two women who worked there were eating. As I was paying, one of the women said something which the man translated as basically “she says you are good looking”. It’s me hat, and tell her she’s a fine woman herself, I replied. With much mutual bowing and thanking, we exited, where I took Mr. Dimibang’s picture. Conclusion: Definitely worth a revisit. 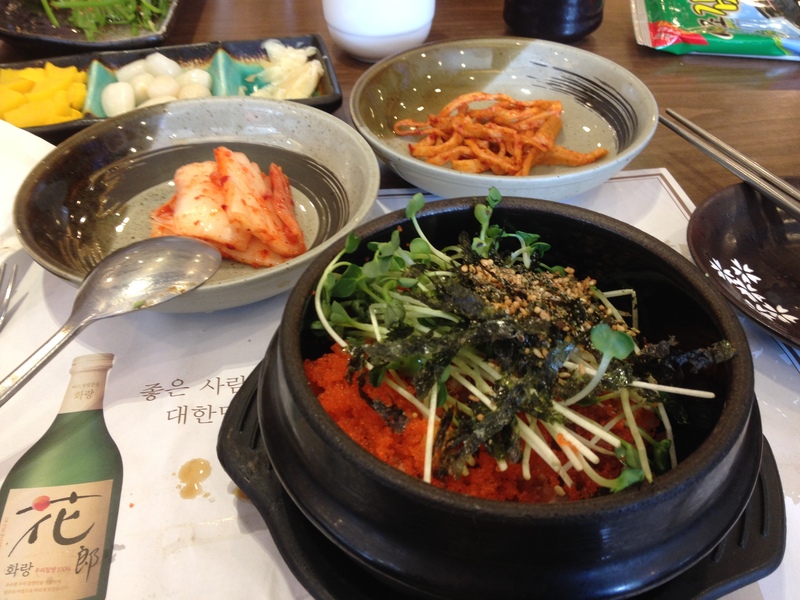 Yesterday, I tried out the local EDokdo restaurant, down on Seongbuk-ro (a.k.a. the big road at the bottom of our hill). From their website, it appears to be one of a national chain. The place was nice enough inside, quite pleasant actually. 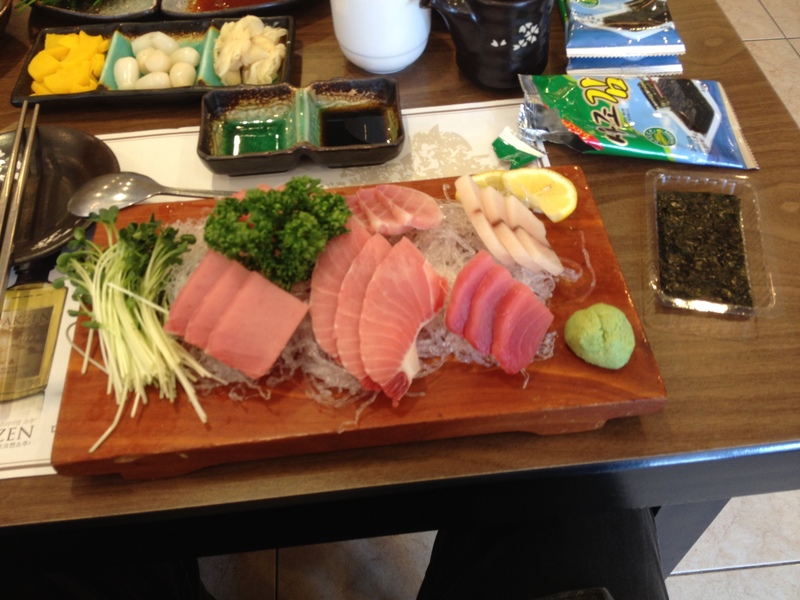 Not having any idea what to order, I picked a relatively inexpensive (18,000 Won) Tuna Set. I’d been told that there plenty of food at this place, and there was. A very nice selection of side dishes: a dried fish (a common feature in fish restaurants, at least in my experience); a warm rice pudding (savory, not sweet); a sort-of-miso soup; courgette kimchee (I tell you, these courgette side dishes are fantastic! ); a brown thing in a red-but-not-chili sauce (tasty, but I have no idea…); a bit of greens; and the ubiquitous kimchee. All very good, I’m feeling confident. But sadly, the main course failed to excite. There was a nice looking plate of raw fish (which, the waiter explained, I should wrap up in the little seaweed papers, like a fish roll-up, and dip in soy sauce or salted oil. Nice enough, except that the fish seemed to be straight from the deep-freeze. If it wasn’t their cooler needs to be set way warmer. There were also two pieces of tuna sushi… similarly over-chilled. And so, not much flavour. Sigh. Part way through the meal, the penultimate surprise: grilled creamed corn. It might have had a bit of cheese or something in it, I’m not sure. It was surprisingly good! Finally, I caught myself out: I forgot to ask “where’s me rice?” A nd, sure enough, when I had finished (most of) everything else, a bibinbap-like dish of rice with lots of orange fish roe and a few other bits’n’bobs came trundling out. 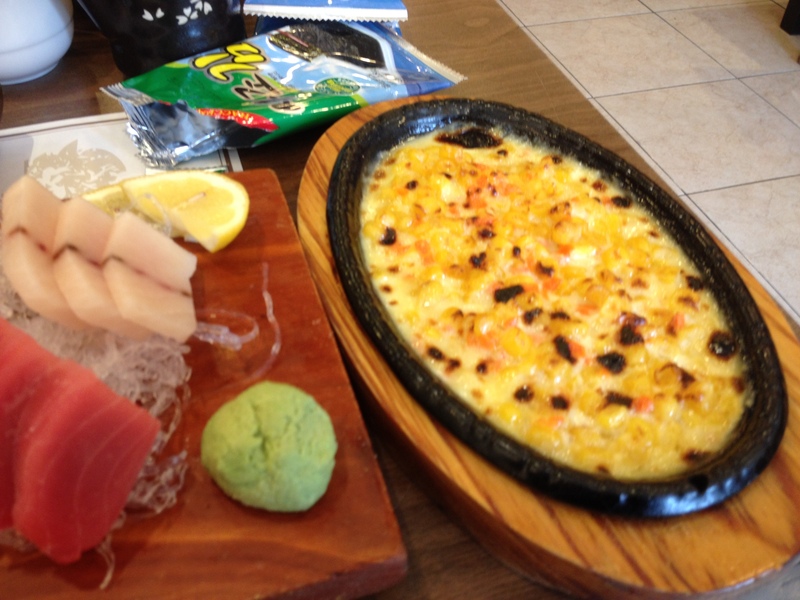 Like the side dishes, also very good. Conclusion: should I bother going back to a fish place that gave the impression of serving frozen fish? I think not.